Jacques Rougeau Jr. (born June 13, 1960) is a Canadian retired professional wrestler best known for his appearances in the 1980s and 1990s with the World Wrestling Federation. He began his career by wrestling under his real name, as part of a tag team called The Fabulous Rougeaus with his brother Raymond Rougeau. In 1991, he began a singles career as The Mountie, winning the WWF Intercontinental Heavyweight Championship once. In 1993, he formed The Quebecers with Pierre Ouellet, and won the WWF Tag Team Championship three times. The Rougeau family as a whole has been very involved in professional wrestling; Jacques is the younger brother of Raymond Rougeau, the son of Jacques Rougeau, Sr., and the nephew of Jean "Johnny" Rougeau, all of whom have worked as professional wrestlers and promoters of wrestling matches. Jacques' sister Johanne also promoted wrestling matches in Montreal, and brother Armand wrestled for smaller federations. Jacques Rougeau began his career in 1977, working in Stu Hart's Calgary, Alberta based Stampede Wrestling promotion. In the 1980s he began wrestling in the United States, achieving success in Alabama and Tennessee, and in 1985 he and Ray were signed by the World Wrestling Federation. Jacques along with Raymond Rougeau made his WWF debut in February 1986 during a tour of Australia. They teamed together as The Fabulous Rougeaus. During their first year with the company they faced and defeated such duos as The Hart Foundation (Bret Hart and Jim Neidhart), The Moondogs, Jimmy Jack and Dory Funk, Jr., and The Dream Team (Greg Valentine and Brutus Beefcake). After two years in the Federation, The Fabulous Rougeaus turned heel when they participated in an angle in which the Canadian brothers were announced as "From Canada, but soon to relocate to the United States", and had an intentionally annoying entrance theme in which they sang (partly in French) about being "All-American Boys" as well as now having Jimmy Hart as their manager (They were also briefly billed from Memphis, Jimmy Hart's home city). They waved tiny American flags, infuriating fans, who questioned their sincerity. They would humorously attempt to start "USA!" chants, which led to further negative fan "heat". According to Jacques, the widespread antipathy of American fans inspired Vince McMahon to turn them into heels. They feuded with The Killer Bees, The Hart Foundation (who had turned face in between), The Bushwhackers, and The Rockers during their heel run. Ray Rougeau retired in early 1990, and Jacques departed the Federation for a year before returning as The Mountie in 1991, once again a client of manager Jimmy Hart. The Mountie was a corrupt, cattle prod-wielding member of the Royal Canadian Mounted Police who would often boasted that he "always gets his man". The cattle prod came into play as part of The Mountie's post-match gimmick, where he would handcuff, berate and then "shock" his defeated and helpless opponents in the stomach. The storyline behind the image change was that Jacques Rougeau had actually gone through the training to become a Mountie to wield authority. The character was eventually the subject of litigation in Canada, leading to Rougeau being enjoined from performing as The Mountie in his home country. Thus, while wrestling in Canada, he was billed using only his real name and did not wear his Mountie-inspired hat and jacket to the ring, although he did retain other parts of his costume such as red shirt, black pants, and boots. The Mountie made his in-ring debut in January 1991. In his pay-per-view debut, he defeated Koko B. Ware at the 1991 Royal Rumble. He gained another major victory at WrestleMania VII, defeating Tito Santana after using the shock stick. The Mountie began a feud with The Big Boss Man after declaring that he was the sole legitimate law enforcer in the WWF, and on August 26, 1991, he spent a night in prison (kayfabe) after Bossman defeated him in a Jailhouse Match at SummerSlam. At Survivor Series, Mountie teamed with Ric Flair, Ted DiBiase and The Warlord to defeat Roddy Piper, Bret Hart, Virgil and Davey Boy Smith in a four-on-four Survivor Series elimination match. The Mountie's greatest achievement as a singles wrestler came when he won the WWF Intercontinental Heavyweight Championship in an upset over Bret Hart on January 17, 1992. In the storyline, Hart was suffering from the flu (Hart was actually going through contract negotiations). The Mountie lost the title just two days later to Rowdy Roddy Piper at the 1992 Royal Rumble, in what was one of the shortest Intercontinental Heavyweight Championship reigns. The Mountie received a rematch at Saturday Night's Main Event, but when he attempted to use his shock stick, it had no effect as Piper was wearing a rubber vest under his T-shirt. Piper removed his shirt after the match to reveal the vest, which was labeled "Shock Proof". Piper won the match after using the shock stick on The Mountie. For the next several months, The Mountie primarily appeared in the undercard. He was on the losing end of an eight-man tag team match at WrestleMania VIII and a six-man tag team match at SummerSlam. He feuded with Sgt. Slaughter after shocking him with an extra large cattle prod on an episode of Superstars, though the subsequent matches all took place on house shows, with no conclusion on television. After losing to then WWF World Heavyweight Champion Bret Hart in thirty seconds on October 26, 1992, Rougeau left the WWF. Jacques returned to the WWF in July 1993 and went on to hold the WWF Tag Team Championship on three occasions as part of The Quebecers tag team with Pierre Ouellet, feuding with The Steiner Brothers, Men on a Mission, The Headshrinkers, and Marty Jannetty and The 1-2-3 Kid. The Quebecers characters were an extension of the earlier Mountie-theme, albeit with a more casual costume and an emphasis on bullying behavior. The pair (who were managed by Johnny Polo) emphasized their detachment from the earlier Mountie controversy by using a doctored version of Jacques's second Mountie theme song, titled "We're Not The Mounties". Jacques participated in the main event of the 1993 Survivor Series as a member of the "Foreign Fanatics" team. at Royal rumble, The Quebecers defeated Bret Hart and Owen Hart by referee stoppage to retain the WWF Tag Team Championship. at WrestleMania X, The Quebecers faced Men on a Mission for the WWF Tag Team Championship and retained after getting counted out. They lost the title to Men on a Mission in an unplanned title change at a house show on March 29, 1994, in London, England. Mabel stunned Pierre who couldn't kick out as he was supposed to. The wrong was righted as they won the belts back on March 31 at another house show. They finally lost the championship to The Headshrinkers on the April 26 episode of Raw and the team split up soon after. The Quebecers broke up at a house show in the Montreal Forum on June 25, 1994. After a loss to The Headshrinkers, Pierre and Polo turned on Rougeau. After a few minutes of Jacques being attacked in front of his hometown crowd, Raymond Rougeau (who by this point was an announcer for the WWF's French-language broadcasts) ran to the ring to save his brother. 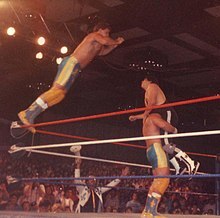 This angle led to Rougeau's first retirement match, which, over the next few months, was heavily promoted on WWF TV shows broadcast in the Montreal area, as well as in the local media. The match, which was held on October 21, 1994, drew a sell-out crowd of 16,843 to the Montreal Forum, and resulted in a victory for Jacques, when he pinned Pierre following a seated tombstone piledriver. Jacques, who was accompanied by Raymond, used Queen's song "We Are the Champions" as his theme music for the night. Beginning on September 9, 1996, Rougeau and Ouellet went on to team again as The Amazing French Canadians in World Championship Wrestling. In 1997, Jacques joined a select few when he cleanly defeated Hollywood Hogan in a singles match at the Molson Centre in Montreal. On the Right After Wrestling program on Sirius Satellite Radio Channel 98, Jacques told hosts Arda Ocal and Jimmy Korderas that Hogan put him over because of his respect for the Rougeau family name and for keeping a clean wrestling image. On Colt Cabana's Art of Wrestling podcast, Rougeau's former student, Kevin Owens stated that there is a rumor that Hogan laid down for Rougeau for an additional $10,000 payment. Rougeau said that he paid and organized the show, so it was a Jacques Rougeau show, not a WCW show. Rougeau teamed up with his brother, Ray (who at the time was a commentator, announcer and host for the French-produced WWF programming) alongside Ouellet in a dark match for WWF Shotgun Saturday Night in 1997. They defeated the team of Edge, Shawn Stasiak, and Tom Brandi. In 1998, Rougeau returned to the WWF for a final run teaming once again with Pierre Ouellet in an updated version of The Quebecers. This incarnation of the team still used the ring attire from their WCW run as the Amazing French Canadians. The Quebecers took part in the tag team battle royal at WrestleMania XIV, They failed to achieve the same success they enjoyed during their prior run, with their only notable feud being with The Godwins, where the Godwins went over. Rougeau and Ouellet briefly reunited in WCW in 2000 in Lance Storm's Team Canada. After retiring, Rougeau attempted to join the Montreal Police Department, but was unable to do so as he had not graduated from high school. He is now a public speaker, touring schools to speak on drugs, smoking, and bullying. He opened the Rougeau Wrestling School in Montreal in 1998. In 2018, Rougeau announced that he would retire for a third time, and that he had closed his wrestling school. On August 18, 2018, Rougeau teamed with his sons for the first and only time, mirroring his father's retirement match. As Rougeau's sons have no interest in pursuing professional wrestling, this is likely the final chapter in the history of the Rougeau wrestling family. Rougeau is divorced. He has three sons. His nephew is former NHL player Denis Gauthier. PWI ranked him # 222 of the 500 best singles wrestlers of the PWI Years in 2003. PWI ranked him # 83 of the 100 best tag teams of the PWI Years with Pierre Ouellet in 2003. 1 ^ Rougeau's reign with Raymond is not officially recognized by WWE. ^ a b c d e f g h i j k l m n o "Jacques Rougeau profile". Online World of Wrestling. Retrieved 2009-08-28. ^ "WWF Royal Rumble 1991 results/info". Pro Wrestling History. Retrieved 2011-12-20. ^ "WWF WrestleMania VII results/info". Pro Wrestling History. Retrieved 2011-12-20. ^ "WWF SummerSlam 1991 results/info". Pro Wrestling History. Retrieved 2011-12-20. ^ "WWF Royal Rumble 1992 results/info". Pro Wrestling History. Retrieved 2011-12-20. ^ "WWF WrestleMania VIII results/info". Pro Wrestling History. Retrieved 2011-12-20. ^ "WWF SummerSlam 1992 results/info". Pro Wrestling History. Retrieved 2011-12-20. ^ a b "1992 WWF results". The History of WWE. Retrieved 2011-05-21. ^ a b "1994 WWF results". The History of WWE. Retrieved 2011-05-21. ^ "Jacques Rougeau talks about pinning Hogan clean". SIRIUS Radio 98. The Score Satellite Radio. Archived from the original on 2011-01-01. Retrieved 2010-11-01. ^ a b c d Woods, Allan (December 13, 2013). "Former wrestling superstar Jacques Rougeau teaches life lessons in the ring". Toronto Star. Retrieved April 1, 2014. ^ Banerjee, Sidhartha (August 17, 2018). "Quebec's Jacques Rougeau hanging up his boots". The Canadian Press. Retrieved August 17, 2018. ^ "Pro Wrestling Illustrated Top 500 - 1992". Online World of Wrestling. Retrieved 2012-08-18. This page was last edited on 20 April 2019, at 09:39 (UTC).